This has been a lovely weekend, friends were staying for a couple of nights just prior to their 25th Wedding Anniversary. 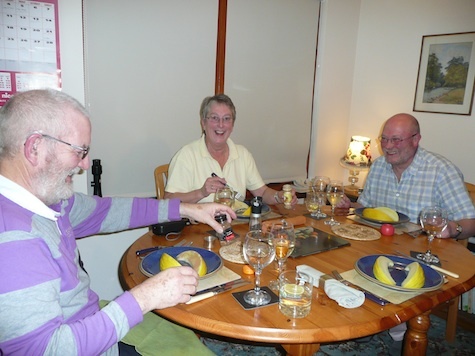 We shared lots of good food, (thanks to HBTW for marvellous meals;) good conversation ranging on shared memories over many years – lots about our time in the Western Isles and various household removals since; and best of all there was loads of laughter. Happy 25th, R and M! This entry was posted in Blog and tagged 25th Wedding Anniversary, cooking, food, laughter. Bookmark the permalink. Wonderful to be with friends! Happy anniversary to your friends! I just love when those perfect evenings happen. It means you have been very very good! Happy Anniversary. I assume one of those fellows is your partner of 25 years. Everyone looks very happy. Congratulations and many more to come Good Lord willing. Audrey the one on the left in the stripped shirt is Freda’s partner of 45 yrs.! Don’t they just look happy! Congratulations to all. Thanks everyone, I’ll pass on the congrats to our friends.